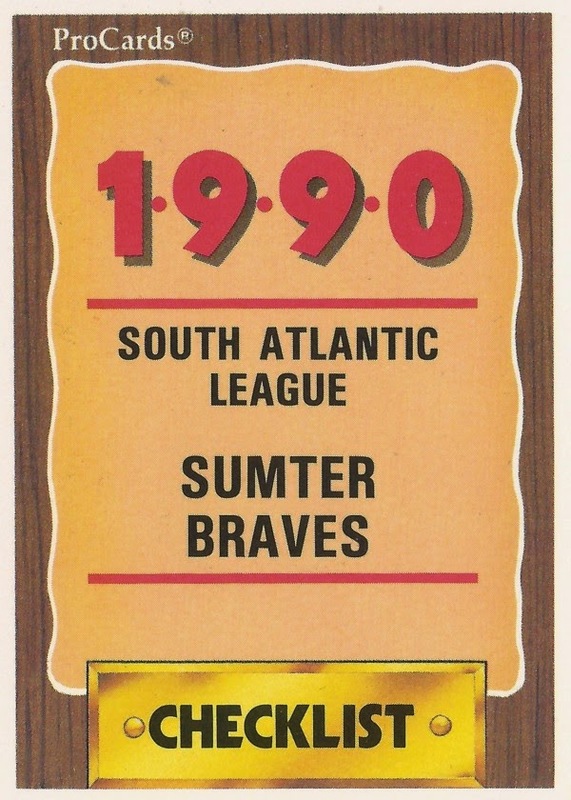 Features on each member of the 1990 Sumter Braves, single-A affiliate of the Atlanta Braves. Players featured are as included in that year's team set. Tab Brown was a second-rounder for the Braves. He only managed time in three pro seasons. Vinny Castilla's minors manager thought he had a chance, if he could hit for power. Mike Gabriele went from college to the pros. He played just two seasons. Steve Glass turned pro and it was one of the happiest and proudest moments of his life. Kevin Haeberle couldn't pitch himself out of every jam. He played just two seasons. Lee Heath went from being a defensive prospect in football to one in baseball. Roger Hailey pitched well at single-A Sumter. He never made AA. Tyler Houston learned to hit. He then made the majors. Earl Jewett threw a no-hitter in his second pro season. He played just three pro seasons. Willy Johnson served as an all-star trainer for 13 minor league seasons. Pat Kelly had a gamer attitude at single-A. He made AAA, but not the bigs. Ryan Klesko wanted a World Series home run for his mom. He played in 16 major league seasons. John Kupsey was a good player in high school. He made the pros for six seasons, but not the bigs. Fred Lopez was praised as a backup catcher at single-A. He played just three seasons as a pro. Gene Martin followed his father to the pros. He later followed him to coaching. Eddie Mathews started his pro career as minors assistant general manager. Miguel Mendez played in two pro seasons, just three games at Sumter. Tom Newman played two seasons, missed double play at single-A. Melvin Nieves played in seven seasons in the bigs and two in Japan. Jose Olmeda moved up to single-A in mid-1990. He later made AAA, but not the bigs. Eddie Perez had the Turner Field fans chanting his name in 1999. Ralph Rowe judged and gave advice to his players using his own eyes. Bill Schafer picked up four wins for Sumter in 1990. They were the final wins of brief pro career. Dan Sims used his speed for an early rookie ball run. He played just two seasons. Shaun Sottile was impressive for his collegiate league team. He played three seasons as a pro. Earl Steinmetz sometimes got the most attention in independent ball. It wasn't always good. Don Strange got the job done at Sumter in 1990. He played eight seasons, but he never made the bigs. Tony Tarasco felt like a 12 year old in his major league debut. He later was shown up by one. Ron Thomas did well in a May 1990 game at Sumter. He played three seasons as a pro. Matt West started his pro career on a dare. Mark Wohlers became a reliever in the minors. He then cranked it up a notch. Ned Yost knew a minor league pennant was icing on the cake. He later got a major league pennant with the Royals.